Bailey of Hollywood 2' snap brim - This lightweight Pork pie has proven itself so well that two new great colors have added to the collection! 100% wool Made in the USA! Bailey Jett is a wool felt hat with a silk finish. 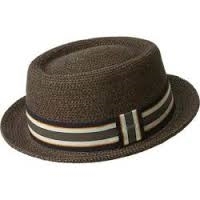 The crown is pork pie style trimmed with a matching grosgrain hat band. There is a small Bailey pin on the left-side of the hat. Feather shown is removable. Bailey Jett has a full satin lining. Made in USA.